Reading and share top 10 famous quotes and sayings about Landmines by famous authors and people. Browse top 10 famous quotes and sayings about Landmines by most favorite authors. 1. "We feel sorry for the poor people who died,' one soldier said. 'But how are we to know who is a terrorist and who isn't?' said another. 'They mingle with the people, with the civilians, and we cannot question each one of them individually. It is either them or ourselves. But in war who has time for pity? We see our men blown up in landmines. The flesh has to be scraped off the Claymores. They are shot by snipers. Reprisals and massacres take place - are these happenings not inevitable in a time of war? Killings will go on. The civilians will always suffer." 2. 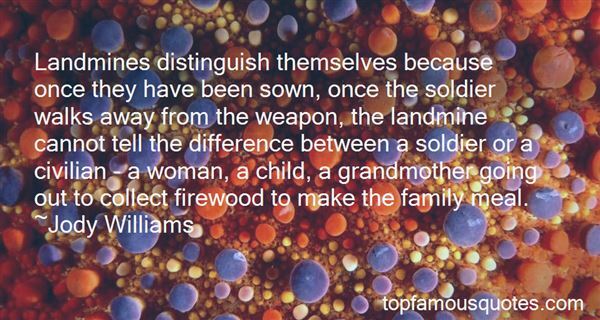 "Landmines distinguish themselves because once they have been sown, once the soldier walks away from the weapon, the landmine cannot tell the difference between a soldier or a civilian - a woman, a child, a grandmother going out to collect firewood to make the family meal." 3. "Guns go home with the soldiers, but landmines are designed to kill - mindlessly, out of control, for years." 4. "Landmines are different from other conventional weapons. When a war is over, the landmines stay in the ground and continue to kill - for decades." 5. "Even soldiers from the Vietnam War had said that when they were fighting in that war, the landmine was just one of any number of weapons to use in the fighting. It wasn't until they began to think about the aftermath and the legacy of landmines that they recognized the long-term, indiscriminate impact of the weapon." 6. "The question in their minds was, why did the outside world, and particularly the Western world, produce all these landmines, and send them to Afghanistan? This business must be stopped. It's a dirty business to produce such a horrible device." 7. "When a group of people are forced to navigate a minefield together, everyone feels a grudging sense of comfort when someone else gets blown up. 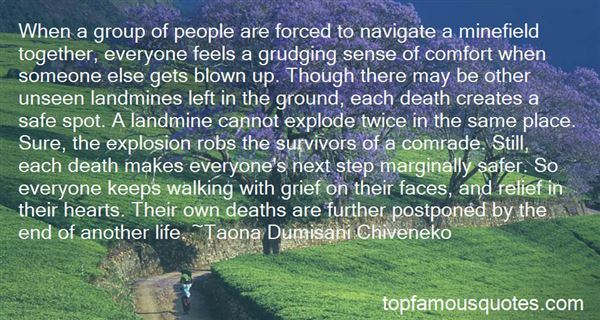 Though there may be other unseen landmines left in the ground, each death creates a safe spot. A landmine cannot explode twice in the same place. Sure, the explosion robs the survivors of a comrade. Still, each death makes everyone's next step marginally safer. So everyone keeps walking with grief on their faces, and relief in their hearts. Their own deaths are further postponed by the end of another life." 8. "The real issues I don't think most people touch. The Clinton jokes are all about Monica Lewinsky and all that stuff and not about the important things, like the fact that he wouldn't ban landmines...I'm not tempted to write a song about George W. Bush. I couldn't figure out what sort of song I would write. That's the problem: I don't want to satirize George Bush and his puppeteers, I want to vaporize them. And that's not funny....OK, well, if I say that, I might get a shock laugh, but it's not really satire." 9. 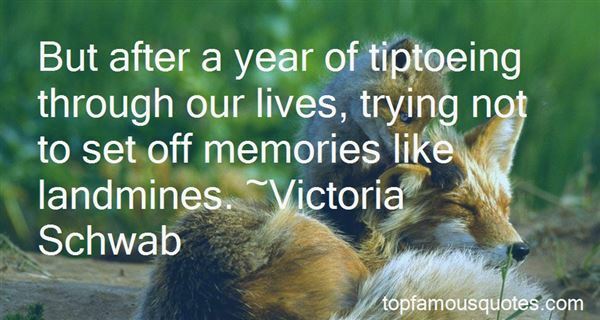 "But after a year of tiptoeing through our lives, trying not to set off memories like landmines." 10. "If we spend our days trying to avoid the landmines of stepping out of God's will, then will be afraid to take any risks for his kingdom. But when you know there is a net of grace, when you know that God will catch you and set you back on his path when you fall, then you'll feel the freedom to pursue the adventure that kingdom living is all about." Gareth's eyes slipped open. "You make me nervous when you do that." "Do what?" "Brood. Your brooding is rather loud." "Oh please. I was hardly—" His eyebrow rose. "Fine. I was brooding. It's not like you don't. ""Mine is inherent to my romantic nature. Cloaks and castles." Adele threw up her hands. "That's it. You are forbidden to look at any more cheap books about yourself."